Bryant Park is one of my most favorite New York locations. 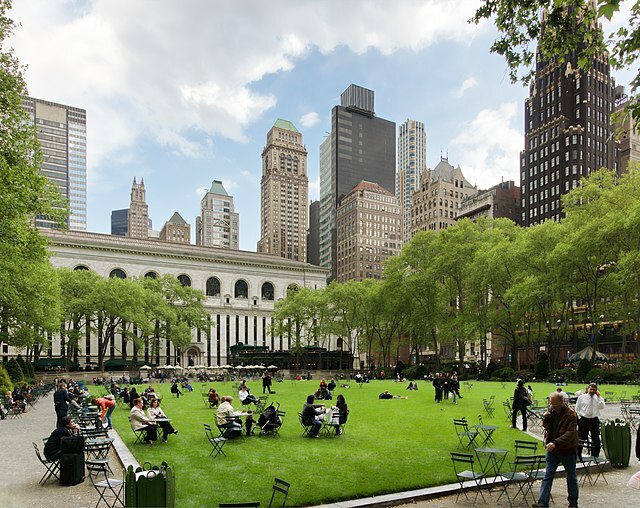 A beautiful Green Lawn in the summer, ample chairs and tables and the New York buildings surrounding the park make for an irresistible View and beautiful photography. Food options are available around the perimeter of the park and Berry from inexpensive to fine dining. Last winter that was a skating rink and shopping and food to brighten the winter experience. Under the full moon, New Yorkers interests are out at night enjoying the moonlight. The park is kept immaculately clean and it has the finest most attractive public bathroom in New York City that I have ever seen. Greatest hang-out park in Manhattan, hands down. If you're a tourist, this has exactly what you're looking for - cafe's activities, and a great fountain overlooking the lawn in front of the main library building which makes for incredible vacation photos. If you're a NYC resident then you know how hard it is to find great spaces in Midtown - this is it. If you live within walking distance, you should spend the summer here. If you work in Midtown, the bars and restaurants int his park are great for after work, and the cafes make for a good lunch-time chill. I go out of my way by one trian stop to make sure I have to walk through this park every day on my way to work! First of all Bryant Park is gorgeous! Second they have so many cool and fun things to do there!!! For example, they have chess tables and a game cart, with all the popular card and board games you can dream of (Did I mention it's All FREE)!!!! In addition, they have a carousel and a FREE Art Cafe, where you can paint and draw to your hearts content! In conclusion, You should definitely visit this Park if you are in New York City!!!! I highly recommend going!!!!! One of my favorite places in the city. It's a peaceful oasis in the middle of Midtown craziness. Lie down on the grass, or grab a chair and sit down by the lawn, just make sure you have good coffee and good company. Enjoy movie nights at Bryant Park during the summer, and a skating rink during the winter!